Not to be confused with Mahmud Hotak or Mahmud Ghazan. "Sultan Mahmood" redirects here. For the Indian Army general, see Sultan Mahmood (general). For the Pakistani social scientist, see Sultan Mahmood (social scientist). 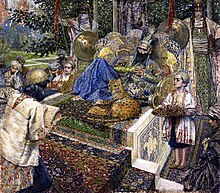 Mahmud of Ghazni (Persian: محمود غزنوی‎; 2 November 971 – 30 April 1030) was the first independent ruler of the Ghaznavid dynasty, ruling from 998 to 1030. At the time of his death, his kingdom had been transformed into a extensive military empire, which extended from northwestern Iran proper to the Punjab in the Indian subcontinent, Khwarazm in Transoxiana, and Makran. Highly Persianized, Mahmud continued the bureaucratic, political, and cultural customs of his predecessors, the Samanids, which proved to establish the groundwork for a Persianate state in northern India. His capital of Ghazni evolved into a significant cultural, commercial, and intellectual center in the Islamic world, almost rivaling the important city of Baghdad. The capital appealed to many prominent figures, such as al-Biruni and Ferdowsi. He was the first ruler to hold the title Sultan ("authority"), signifying the extent of his power while at the same time preserving an ideological link to the suzerainty of the Abbasid Caliphate. During his rule, he invaded and plundered parts of the Indian subcontinent (east of the Indus River) seventeen times. Mahmud was born in the town of Ghazni in the region of Zabulistan (now present-day Afghanistan) on 2 November 971. His father, Sabuktigin, was a Turkic slave commander (ghilman) who laid foundations to the Ghaznavid dynasty in Ghazni in 977, which he ruled as a subordinate of the Samanids, who ruled Khorasan and Transoxiana. Mahmud's mother was the daughter of an Iranian aristocrat from Zabulistan, and is therefore known in some sources as Mahmud-i Zavuli ("Mahmud from Zabulistan"). Not much about Mahmud's early life is known, he was a school-fellow of Ahmad Maymandi, a Persian native of Zabulistan and foster brother of his. Mahmud married a woman named Kausari Jahan, and they had twin sons Mohammad and Ma'sud, who succeeded him one after the other; his grandson by Mas'ud, Maw'dud Ghaznavi, also later became ruler of the empire. His sister, Sitr-e-Mu'alla, was married to Dawood bin Ataullah Alavi, also known as Ghazi Salar Sahu, whose son was Ghazi Saiyyad Salar Masud. Sabuktigin died in 997, and was succeeded by his son Ismail as the ruler of the Ghaznavid dynasty. The reason behind Sabuktigin's choice to appoint Ismail as heir over the more experienced and older Mahmud is uncertain. It may due to Ismail's mother being the daughter of Sabuktigin's old master, Alptigin. Mahmud shortly revolted, and with the help of his other brother, Abu'l-Muzaffar, the governor of Bust, he defeated Ismail the following year at the battle of Ghazni and gained control over the Ghaznavid kingdom. He then appointed Abu'l-Hasan Isfaraini as his vizier. He then set out west from Ghazni to take the Kandahar region followed by Bost (Lashkar Gah), where he turned it into a militarised city. Mahmud initiated the first of numerous invasions of North India. On 28 November 1001, his army fought and defeated the army of Raja Jayapala of the Kabul Shahis at the battle of Peshawar. In 1002 Mahmud invaded Sistan and dethroned Khalaf ibn Ahmad, ending the Saffarid dynasty. From there he decided to focus on Hindustan to the southeast, particularly the highly fertile lands of the Punjab region. Mahmud's first campaign to the south was against an Ismaili state first established at Multan in 965 by a da'i from the Fatimid Caliphate in a bid to curry political favor and recognition with the Abbasid Caliphate; he also engaged elsewhere with the Fatimids. At this point, Jayapala attempted to gain revenge for an earlier military defeat at the hands of Mahmud's father, who had controlled Ghazni in the late 980s and had cost Jayapala extensive territory. His son Anandapala succeeded him and continued the struggle to avenge his father's suicide. He assembled a powerful confederacy that suffered defeat as his elephant turned back from the battle at a crucial moment, turning the tide into Mahmud's favor once more at Lahore in 1008 and bringing Mahmud into control of the Shahi dominions of Udbandpura. In 1014 Mahmud led an expedition to Thanesar. The next year he unsuccessfully attacked Kashmir. In 1018 he attacked Mathura and defeated a coalition of rulers there while also killing a ruler called Chandrapala. In 1021 Mahmud supported the Kannauj king against Chandela Ganda, who was defeated. That same year Shahi Trilochanapala was killed at Rahib and his son Bhimapala succeeded him. Lahore (modern Pakistan) was annexed by Mahmud. Mahmud besieged Gwalior, in 1023, where he was given tribute. Mahmud attacked Somnath in 1025, and its ruler Bhima I fled. The next year, he captured Somnath and marched to Kachch against Bhima I. That same year Mahmud also attacked the Jat people of Jud. The Indian kingdoms of Nagarkot, Thanesar, Kannauj, and Gwalior were all conquered and left in the hands of Hindu, Jain, and Buddhist kings as vassal states and he was pragmatic enough not to neglect making alliances and enlisting local peoples into his armies at all ranks. Since Mahmud never kept a permanent presence in the northwestern subcontinent, he engaged in a policy of destroying Hindu temples and monuments to crush any move by the Hindus to attack the Empire; Nagarkot, Thanesar, Mathura, Kannauj, Kalinjar (1023) and Somnath all submitted or were raided. In 1025 Mahmud raided Gujarat, plundering the Somnath temple and breaking its jyotirlinga. He took away a booty of 2 million dinars. Historians estimate the damage to the temple to have been minimal because there are records of pilgrimages to the temple in 1038 that make no mention of any damage. However, powerful legends with intricate detail had developed regarding Mahmud's raid in the Turko-Persian literature, which "electrified" the Muslim world according to scholar Meenakshi Jain. 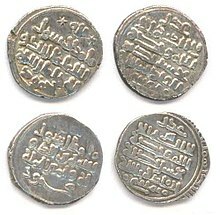 Silver jitals of Mahmud of Ghazni with bilingual Arabic and Sanskrit minted in Lahore 1028. Legend – averse: la ilaha illa'llah muhammad rasulullah sal allahu alayhi wa sallam; reverse: avyaktam eka muhammada avatāra nrpati mahamuda. 1025: Somnath: Mahmud sacks the temple and is reported to have personally hammered the temple's gilded Lingam to pieces, and the stone fragments are carted back to Ghazni, where they are incorporated into the steps of the city's new Jama Masjid (Friday Mosque) in 1026. He places a new king on the throne in Gujarat as a tributary. His return detours across the Thar Desert to avoid the armies of Ajmer and other allies on his return. Mahmud used his plundered wealth to finance his armies which included mercenaries. The Indian soldiers, which Romila Thapar presumed to be Hindus, were one of the components of the army with their commander called sipahsalar-i-Hinduwan lived in their quarter of Ghazna practicing their own religion. Indian soldiers under their commander Suvendhray remained loyal to Mahmud. They were also used against a Turkic rebel, with the command given to a Hindu named Tilak according to Baihaki. By the end of his reign, the Ghaznavid Empire extended from Ray in the west to Samarkand in the north-east, and from the Caspian Sea to the Yamuna. Although his raids carried his forces across the Indian subcontinent, only a portion of the Punjab and of Sindh in modern-day Pakistan came under his semi-permanent rule; Kashmir, the Doab, Rajasthan, and Gujarat remained under the control of the local Hindu dynasties. On 30 April 1030 Sultan Mahmud died in Ghazni at the age of 58. Sultan Mahmud had contracted malaria during his last invasion. The medical complication from malaria had caused lethal tuberculosis. The military of Pakistan has named its short-range ballistic missile the Ghaznavi Missile in honour of Mahmud of Ghazni. In addition, the Pakistan Military Academy, where cadets are trained to become officers of the Pakistan Army, also gives tribute to Mahmud of Ghazni by naming one of its twelve companies Ghaznavi Company. ^ Grousset 1970, p. 146. ^ a b Meri 2005, p. 294. ^ Heathcote 1995, p. 6. ^ Anjum 2007, p. 234. ^ Bosworth 1991, p. 65. ^ a b c Bosworth 2012. ^ Nazim & Bosworth 1991, p. 915. ^ Neill 2008, p. 308. ^ Nazim & Bosworth 1991, p. 65. ^ Bosworth 1983, pp. 303-304. ^ Bosworth 1963, p. 89. ^ a b Holt, Lambton & Lewis 1977, p. 3-4. ^ Saunders 1947, p. 162. ^ a b Barnett 1999, p. 74-78. ^ Khan 2007, p. 66. ^ Yagnik & Sheth 2005, pp. 39–40. ^ Thapar 2005, pp. 36–37. ^ Thapar 2005, p. 75. ^ Thapar 2005, Chapter 3. ^ Meenakshi Jain (21 March 2004). "Review of Romila Thapar's "Somanatha, The Many Voices of a History"". The Pioneer. Retrieved 15 December 2014. ^ Thapar 2005, p. 14. ^ Blank 2001, p. 37. ^ Hanifi 1964, p. 21. ^ Daftary 2005, p. 68. ^ a b c Barua 2005, p. 27. ^ Chandra 2006, p. 18. ^ Kumar 2008, p. 127. ^ Qassem 2009, p. 19. ^ Virani 2007, p. 100. ^ Eaton 2000, p. 63. ^ Romila Thapar. Somanatha: The Many Voices of a History. Verso. p. 40. ^ Habib 1965, p. 77. ^ "Arts, Islamic". Encyclopædia Britannica Online. 20 October 2006. ^ Bosworth 1963, p. 132. Ramachandran, Sudha (3 September 2005). "Asia's missiles strike at the heart". Asia Times Online. Bosworth, C. Edmund (1983). "Abu'l-Ḥasan Esfarāʾīnī". Encyclopaedia Iranica, Vol. I, Fasc. 3. London et al. pp. 303–304. Grousset, René (1970). The Empire of the Steppes: A History of Central Asia. Rutgers University Press. pp. 1–687. ISBN 9780813513041. Meri, Josef W. (2005). Medieval Islamic Civilization: An Encyclopedia. Routledge. pp. 1–1088. ISBN 9781135455965. Bosworth, C. Edmund (2012). "Maḥmud b. Sebüktegin". Encyclopaedia Iranica.